Over the last several months, there hasn't been anyone in WWE who has been consistently more over than "The Man" Becky Lynch. Originally, the former SmackDown Women's Champion wasn't supposed to be in the main event of WWE's biggest show of the year, as the spot was pegged for Charlotte Flair. 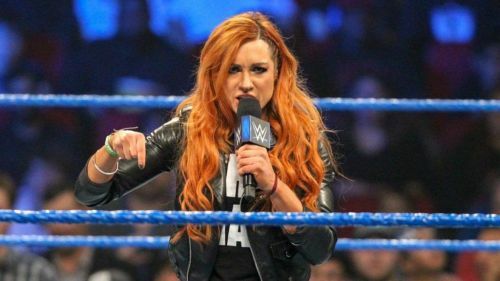 One would assume that WWE is going to do the right thing, which is put the Raw Women's Title on Becky Lynch in the main event of WrestleMania 35, as it would likely be a complete disaster if they decided to do anything else. The interesting question is, who does she end up pinning or submitting? Many believe that she should tap out Ronda Rousey, as the current Raw Women's Champion is rumored to be leaving WWE after WrestleMania. But, you can't rule out that they'll have Becky beat Charlotte at the event in order to protect Rousey if she decides to come back at some point, or if she's going to be sticking around for a little while longer. Regardless of what happens, everyone expects Becky Lynch to win the Raw Women's Championship at WrestleMania, and here are four women who she could end up facing after the event. Current NXT Women's Champion Shayna Baszler has been in WWE's developmental system for quite some time now, which means that she could be heading up to the main roster soon. We all know that WWE is planning on doing their annual Superstar Shakeup exactly eight days after WrestleMania 35, and Baszler could be one of the few NXT stars who gets called up to the main roster. Baszler is one of Ronda Rousey's close friends, so if the current Raw Women's Champion does leave WWE after dropping the title to Becky Lynch, it would make sense for the current NXT Women's Champion to make her Raw debut during the Superstar Shakeup, where she'd presumably challenge "The Man" for the red brand's main Women's Championship.